Running With Glitter: Running With Glitter #6 Link Party! Running With Glitter #6 Link Party! 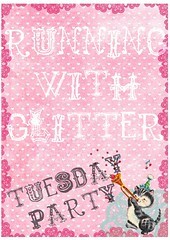 Running With Glitter's 6th Link Party! And This is the LAST week for the Bowdabra GIVEAWAY! Just add the link to your specific post (not the main page of your blog). If you want please grab my party button to help share the love. Feel free to link as many posts as you would like as long as they are new to the Glitter Blog. Some of my best projects are a little older, and it is fun to bring them back to life from time to time! You can link anything you want as long as you're not doing a direct sell. I will Leave the Party open until Thursday at midnight.